How much does it cost to travel to Varanasi? How much money will you need in Varanasi? ₨1,245 ($18) is the average daily price for traveling in Varanasi. The average price of food for one day is ₨262 ($3.77). The average price of a hotel for a couple is ₨1,597 ($23). Additional pricing is in the table below. These average travel prices have been collected from other travelers to help you plan your own travel budget. How much money do I need for Varanasi? Known to be one of India's holiest cities, many come to Varanasi on a spiritual pilgrimage looking to bathe in the sacred waters of the Ganges River. Dating back to the 11th Century BC, it is also one of the oldest continuously inhabited cities in the world. Centuries old temples make up the backdrop, as many come and come again to perform their holy rights at the edge of the historic river. When it comes to sight-seeing, the main spectacle in Vanarasi is centered on the river. Every day people come to bathe in the sacred waters of the Ganges, and every day cremations are performed at the water's edge. It is a celebration of life and death, a place where the cycles of the world come full circle. The shores of the Ganges River are lined with stairs that lead right into the water (known as ghats). With over 80 sets total, the entire length of the river that runs past Varanasi is lined with ghats for easy access to the waters. Some of the more popular ghats include Panchganga Ghat, Manikarnika Ghat, Dasaswamedh Ghat, Rana Ghat, and Kedar Ghat. There are also a handful of temples like the Alamagir Mosque where you can get a great view of the area from above as well as the Gauri Matha Temple, Kaal Bhairav Temple, Shri Kashi Vishwanth Temple, and Sankat Mochan Temple which is home to thousands of monkeys. Other notable sights include Ramnagar Fort, Chunar Fort, Kriti Gallery, and the Man Mandir Observatory. The highlight of activity in Varanasi convenes at the edge of the Ganges River. Its entire shoreline running north-south on the eastern border of the city is lined with ghats, or series of stairsmost built by Hindu kings who wanted to die along the Ganges. They even built lofty palaces along the river to spend their final days, most of which are now hotels. You can walk along the river's edge to see all of the ghats, or even take a tour by boat to see them from the river. Banaras Hindu University is another hub, existing as the largest residential university in Asia. It is home to the Bharat Kala Bhavan, a museum of Art and Archaeology, as well as the Vishwanath Temple. Throughout Vanarasi, there are plenty of options for dining, shopping, and entertainment. Take some time to wander amongst historic streets and get lost in the allure of the eastern culture. The most common activity when visiting Vanarasi is to watch the pilgrims who come to wash in the waters of the Ganges, usually occurring at sunrise. 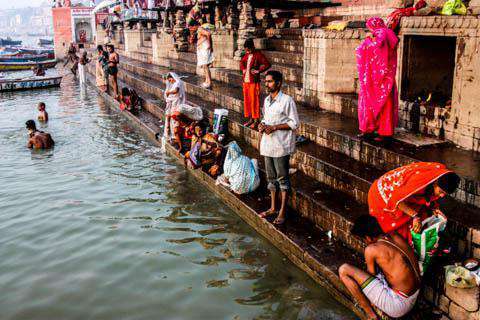 Over 60,000 come to the ghats every day to take the steps down to the holy river. Also very popular, especially at sunrise and sunset, are boat rides along the river. From the river you can experience the ceremonies of bathing and cremation at a distance. In the evenings, several of the ghats are host to large free ceremonies that involve dancing, ritual acts, and other interesting sights. In a somewhat organized manner, young men will perform a sacred ceremony while several hundred spectators watch from both the ghats and boats on the river. For more information about this, read evening aarti at the Varanasi ghats. Bring your camera! Other than that, the best thing to do in Vanarasi is to explore the winding streets and alleyways, soaking up sounds, sights, and smells of India's spiritual capital. In Vanarasi, and all of India, foods are flavorfully spiced with herbs like asafoetida, ginger, bay leaves, cloves, cardamom, curry, cinnamon, and many more. Local delicacies like Banarasi Khana are made with these staples and are often accompanied by vegetables. Benares Dum Aloo is another local dish made with potatoes that are stuffed and cooked in a gravy of spices including jaggery, fennel, and chili paste. Street food is also popular with something like aloo chaat (fried potatoes cooked in spices) being the most common. Paan is another delicacy known all over India. With the ingredients wrapped up with betel leaves and areca nuts, the little packages are chewed whole and then spit out or swallowed. They can be made with tobacco or other flavors that are sweet, consumed mostly for their stimulant and psychoactive properties. When it comes to confections, Rabri Malai Balai is a popular dessert made with milk, sugar, almonds, and pistachio nuts. And as far as drinks go, Lassi is the most common and versatile made with yogurt, water, spices, and sometimes fruit. With Hinduism as the dominant religion in India, cows are considered sacred - thus beef is rarely served. By plane, Lal Bahadur Shastri Airport is the closest airport, located about 25 kilometers northwest of the city center. From here Air India, JetKonnect, SpiceJet, and IndiGo all operate regular flights to Delhi, Mumbai, Kolkata, Bengaluru, Hyderabad, Khajuraho, and Visakhapatnam amongst a few others. By train, there are three railway stations in the city: Varanasi Junction, Manduadih Railway Station, and Mughal Sarai Junction. Some daily services operate trains to cities like Delhi (13 hours), Agra (13 hours), Lucknow (7 hours), Mumbai, and Kolkata. The bus station in Varanasi is located just east of the Varanasi Junction train station. Be aware that trains and buses are often dirty and overcrowded. Wake up at sunrise and head to the river front to see everyone bathing in the spiritual Ganges River. You can hire a boat to take you down the river, which is one of the most unique experiences in India.